Some time back I visited Pondicherry and on my way back to Chennai happened to visit a temple dedicated to Lord Hayagreevar. The temple is located at Chettipunyam, on the outskirts of Chennai on the Chennai to Chengalpattu NH 45. From Chennai it is located at a distance of 50 Kms just opposite to Mahindra World City. The Lord Hayagriva is an avatar of Lord Vishnu. He is worshipped as the God of knowledge and wisdom with a human body with Horse Head, brilliant white in colour with white garments and seated on a white lotus. 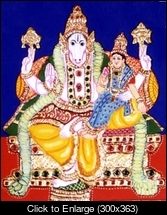 The avatar of Hayagriva Bhagavan took place to restore the Vedas to Brahma. Brahma became extremely conceited about his power as the creator. Lord Narayana discerning this, decided to rid Brahma of his pride. A couple of water droplets from the lotus seat of the Lord incarnated as two Asuras, Madhu and Kaitabha, who stole the Vedas from Brahma. Unable to carry on his work of creation without the Vedas, Brahma beseeched Lord Narayana for help. Lord Narayana incarnated as Hayagriva and destroyed the Asuras and restored the Vedas to Brahma. Swami Desikan has very eloquently described the greatness of Bhagavan Hayagriva in the Hayagriva Stotram. Many references from the Hayagriva Upanishad are succinctly contained in Swami Desikan's tribute. Though a Sannidhi for Varadaraja Perumal has been in this temple for more than 350 years, with the efforts of Sirasdar Rao Sahib Rangachar that the idol of ‘Devanathaswamy’ of Tiruvahindrapuram got installed here. Along with Devanathaswamy the ‘Hyagriva’ idol a small but bewitching deity was brought here and installed in the year 1848. The idols of Thayar, Sridevi, Boodevi and Andal were installed after this. There is a separate sanctum sanctorum for Lord Sri Rama along with Sita, Lakshmana and Hanuman. These idols were brought by one Mudumbai Sri Ramaswamy Iyengar from Tanjore Palace and were initially located at Vandalur in 1868. These idols were later installed at Chettipunyam when Iyengar migrated to Bangalore. The villagers conduct the ‘Tiruparvettai’ festival in the Tamil month of ‘Thai’. The temple along with devotees organises a number of utsavams like Sri Jayanthi, Vaikunda Ekadasi, Desikan Sathumurai, Adi Pooram, Panguni Uthiram, Udayavar Sathumurai and Sri Ramanavami. Near to this Hayagreeva temple there is also the famous temple for Lord Narasimha at the village called ‘Singa Perumal Koil’ which is located at a distance of just 5 Kms. Hence you can combine both these temple and have darshan of Lord Hayagreeva and Lord Narasimha. As Lord Hayagriva is the embodiment of knowledge the temple attracts lots of students. Please visit Chettipunyam and receive the punyam showered by Lord Hayagriva who bestows upon his devotees knowledge, wealth and progress in all walks of life.